Location: Fukuoka City, Fukuoka Pref. 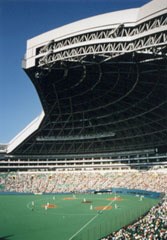 The Fukuoka Dome opened in April, 1993 as the first baseball park in Japan with a retractable domed roof. Its dimensions also made it the largest indoor stadium: 222 meters (728 feet) in diameter; roofed capacity of 1.76 million cubic meters (2.3 million cubic yards); and field area of 13,500 square meters. 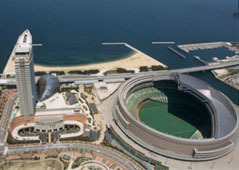 Currently, the Fukuoka Daiei Hawks, professional baseball team owns the franchise, and the stadium is also used for other sporting events, concerts, and so on. 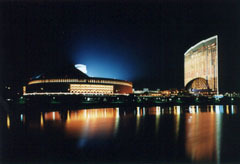 Made from three fan-shaped, steel-framed panels with a surface area of 50,000 square meters (59,795 square yards), the biggest feature of the Fukuoka Dome is its retractable roof. Each of the panels is four meters thick and, even though the surface layer is a 3-millimeter (0.12-inch) sheet of titanium, the total roof weighs 12,000 tons. Supported by 24 bogie wheel assemblies, two of the panels (weighing 4,200 tons and 4,000 tons) slide around under the third fixed panel. Opening and closing operations take just 20 minutes. Vibration control dampers are fitted to the copula so that, in the event of high winds or earthquakes, the panels will not collide with each other. The stadium can be used for various sporting events besides baseball: by moving the 6,000-seat grand stand a rectangular field can be created. Other design features show consideration for the environment: for example, rainwater that falls on the roof is collected, filtered, and used for the flush toilets.